Motorbike sports in Russia are still experiencing difficulties, despite high-status competitions, shiny new racetracks and successful riders. What are the reasons for Russian motorcycle racing’s failure to live up to its potential? Anna Boiko investigates. Until recently, Russian motorcycle racing outside of Russia was exclusively linked to motocross. In the second half of the last century, Soviet racers were a force to be reckoned with. The names of motocross racers Vladimir Kavinov, Igor Grigoriev, Gennady Moiseyev, and Viktor Arbekov were familiar to fans of the sport in many countries. But motocross was forgotten in Russia in the 1990s, and for a long time, Russian names disappeared from the world rankings. After a lengthy hiatus, Russian motorbike sports began to be talked about once again in 2012, when the long-awaited Russian stage appeared on the Superbike World Championship calendar. This was made possible thanks to the new Autodrom Moscow, designed by Hermann Tilke. Promoter Yakhnich Motorsport appeared on the scene with a 10-year contract to host the Russian Superbike race. Motorbike sports had returned to Russia, and overnight, the sport’s most important hero became Vladimir Leonov, captain of the Yakhnich Motorsport team and competitor in the Supersport class. Leonov was at his best in the first domestic race, taking third on the podium and showing the whole world that Russian motorcycling means business. The Russian stage of the world Superbike has now taken place twice in the summer months (the Russian stage was canceled in the 2014 season for technical reasons). This tradition will most likely continue in the next year, although the championship calendar for the 2015 season has not yet been approved. This year, Russia will have another world-class track – the Sochi Autodrom. Motorsports fans are hoping that this will open the road to a motorcycle racing series, but the organizers are keeping silent for now. The first and main event at the new racetrack in Sochi will be the Russian Formula 1 Grand Prix in October 2014. There is a Russian domestic circuit championship, but it is not doing particularly well. One of this year’s incidents involved personnel changes in the Motorcycle Federation of Russia and the replacement of the national championship’s organizer, which led to the decision not to hold the Russian Championship and Superbike Cup in 2014. However, the racers and teams have found an alternative: the Russian Superbike Championship International Cup in 2014, which is open for foreign athletes. Russian motorbike sports have their own specifics. Racers themselves pay completely or partially for their participation in the championship, for the work done by mechanics, and for the maintenance of their equipment. 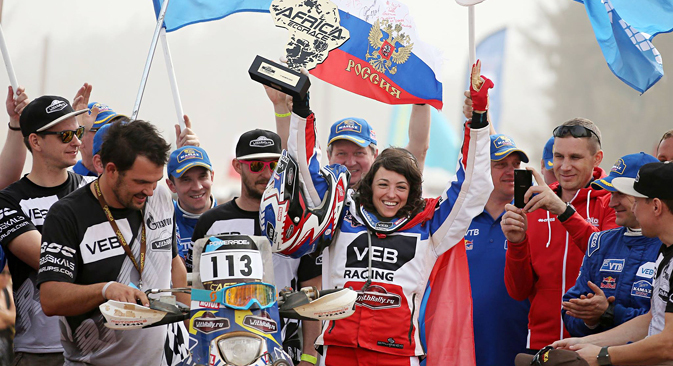 This season, Nifontova was the first Russian woman to participate in the World Cup for Cross Country Rallies, taking second place in the Abu Dhabi stage. However, the racer is still approaching the domestic championship with a sense of responsibility. Forming a proper motorcycle culture means setting the right direction for years to come. Sergei Vlasov, Russian champion in motorcycle circuit racing (2010 and 2013), member of the Superbike World Championship, and commentator, believes that state investment is required for better championships and motorbike sports. Nifontova, however, is more optimistic: “It is much easier for us to cultivate decent riders now than it was 15 years ago. However, we are still a far way off from getting them to the level of Italy or Spain,” she said, pointing out that the climate was an important factor. However, there is one discipline in motorbike sports in which the Russians are unrivaled: ice speedway. Just look at the absolutely incredible achievement of Nikolai Krasnikov, a living legend. Krasnikov is an 18-time world champion in ice speedway and has been awarded the honorary title of ‘Ice Gladiator’ in the FIM Ice Speedway Gladiators World Championship eight times. Last year, Krasnikov ended his professional career. However, the podium is not empty. Now fans’ eyes have turned to another Russian, Daniil Ivanov, who was the world champion in the individual competition last year. The Ice Speedway World Championship is held every winter in different European countries. Two finals take place in Russia on ice ovals in different cities.